Steve Broussard has some great cards. His Skybox is exceptional. The resolution on the shot is so high you can make out the expression on Steve’s face. After nabbing him for my set need in Action Packed Rookies 1990, his two Score entries make the list for me, just barely over his Proset 1990 draft card. I tend to lean more full body shot if I can, especially if it is one where the player is in the open field. Anyway, I am very pleased to get him. I took a shot in the dark at his work address, knowing fully that in the past he has pulled any number of hijinks on autograph requesters, including having his kids sign for him. I did not count on getting these back also based on my previous experience, but after 100 days flat, the enigmatic back kindly signed these 4 cards for me. The autograph is in ball point pen- a disappointment, considering the amazing loops and varying size of his graph. Steve finished second all-time on the Washington State career rushing charts with 3,054 yards and first in total touchdowns (41). 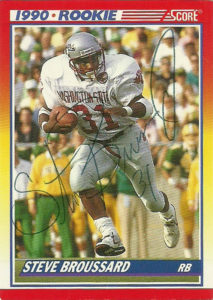 During his Senior year in ’89 he had a career high 41 carries for 205 yards against Oregon. He also displayed his versatility by winning the WAC rushing title in 1989 (1237 yards) and receiving title in 1987 (59 receptions), distinguishing himself as only the second player in Conference history to do so. He’d be selected in the first round by the Atlanta Falcons in 1990. Steve had a bumpy rookie season as injuries limited his campaign to 13 games. Still the compact halfback showed promise chewing up 454 yards on the ground and making 24 receptions. 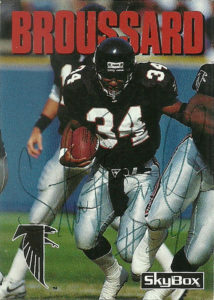 With a crowded backfield in the Red Gun system, Broussard continued to demonstrate himself as a nice change of pace, 3rd down back throughout his time in Atlanta- however he saw his playing time decrease every year after his rookie campaign. After the 1993 season, Steve played one year in Cincinnati and recorded a career high 621 yards from scrimmage (403 yards rushing and 218 yards receiving). He then returned to his home state and played for the Seahawks for the remainder of his career in the NFL. 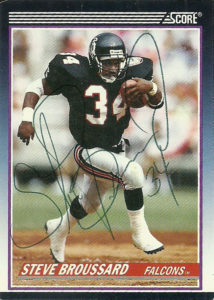 With the Seahawks, Steve was used primarily as a kick returner where he demonstrated that burst of speed that made him so dangerous. After the 1998 season, Steve retired. Steve went into coaching first at the high school level. He then moved on to the college level with stops at Portland State, Washington State, ASU, SMU, ICLA, and Pasadena Community College. In 2017 he returned to Washington and coaches at a local high school in Vancouver. Greg Bell is one of these pros that got no respect. He flew under the radar at Notre Dame, posting 158 career carries, 870 yards and 10 TDs. His stats were diminished due to a broken leg in his junior year and a sprained ankle in his senior campaign. He’d be selected in the first round of the 1984 draft by the Buffalo Bills. 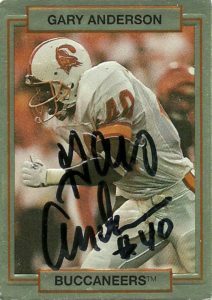 The Bills were reeling from the loss of All-Pro back Joe Cribbs to the USFL Birmingham Stallions. They ran a ground pound offense that was very much dependent on a solid backfield. Greg’s rookie season was that solid effort the Bills were looking for. He had 262 carries for 1100 yards -on the dot- 7 TDs and an NFL long 85 yard jaunt. He also displayed solid hands catching 34 passes for 277 yards and a TD. He’d earn his one and only Pro Bowl appearance after the season. In 1985 things got awkward, as Joe Cribbs returned to the Bills. Greg split time at RB and FB for Buffalo, but with Cribbs return, it ate into Bell’s numbers. Still Greg set a career high with 58 receptions for 576 yards, to go along with a bit over 880 yards and 8 TDs rushing. After a poor showing in 1986, Greg found himself as an integral part of NFL history. In 1987, Eric Dickerson was having a nasty holdout with the Los Angeles Rams- a notoriously cheap franchise at the time. The Rams pulled a colossal trigger with both the Indianapolis Colts AND the Buffalo Bills. The Rams received a bevy of draft choices from both teams and running backs Owen Gill (IND) and Greg Bell. The Colts got Dickerson, and the Bills got Cornelius Bennett. Before the Herschel Walker trade, this was considered the largest blockbuster trade of all time. Greg saw very little time in the lineup during 1987. It’d be in 1988 that he’d really shine. Under the Ernie Zampese Rams offense and coach John Robinson, the Rams were a threat not only to throw the ball with Jim Everett, but to run it as well with Greg. Bell had his best season as a pro in ’88, racking up 1212 yards on 288 carries, he’d also lead the NFL in rushing TDs with 16. He’d follow up his stellar 88 season with much the same in 1989 with 272 carries for 1137 yards and a league leading 15 TD rushing. – All this from the guy who was considered a ‘toss in’ on the Eric Dickerson trade. The problem is Greg didn’t apparently really earn too many friends in the Rams organization. Bell was just different… He was also what was termed as a ‘sidewinding runner’ which could also have contributed to the 13 fumbles he had in 2 seasons in LA. 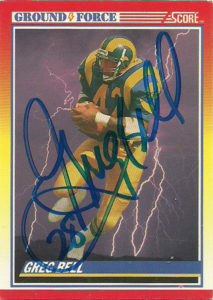 Greg wanted to renegotiate his contract with the Rams in 1990. The notoriously stingy Rams felt otherwise, especially after just signing him to a new deal last year. With seemingly solid runningback depth at the time, and gambling on the health of former Seahawk Curt Warner, LA jettisoned Greg for a 4th round pick to the LA Raiders. There he just… disappeared. True. The Raiders were stacked at runningback with Marcus Allen and (later in the year after baseball commitments,) Bo Jackson, but Bell had no media impact whatsoever. 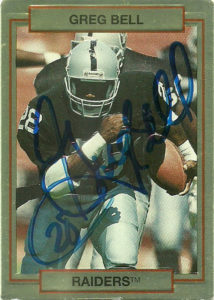 I remember looking at his Action Packed Rookies card and just being so upset he was a Raider. He was active for just 6 games in 1990 rushing for just 164 yards on 47 carries and scoring just 1 TD. He’d battle for an injury settlement as a final roster cut and retire in 1991. Greg has had a lot of time to reflect on his playing days. He enjoys being a dad and has his own radio show. Well Greg Bell was turning into quite the white whale for me. When I mailed out to him in 2010, I was excited for the chance to get his autograph. Instead I got my return envelope back with my cards unsigned. While that was disappointing, I had hoped for another shot to get him on these two cards. Months turned to years, and I waited patiently for a paid signing. Finally almost 8 years after I failed, I found a paid signing through Sportscollectors.net. Arkansas runningback Gary Anderson has had quite a long career in many leagues. He played from 1979 to 1982 for the Razorbacks, compiling 1,999 yards rushing on 392 carries, scoring 10 TDs, and displaying soft hands catching 94 passes for 1,075 yards and 8 TDs. Selected in 1983 by the San Diego Chargers- Gary opted to play for the upstart USFL instead. 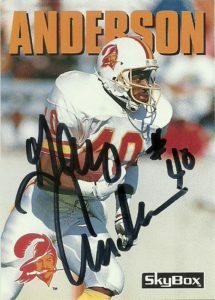 After the New Jersey Generals traded Anderson’s rights to the Tampa Bay Bandits, he became the go to back in Steve Spurrier’s Banditball offense. He’d finish 4th in the league with 2,731 yards and 39 touchdowns during his time in the league before it folded up shop. By the time Anderson got around to the Chargers, San Diego wasn’t really sure what to do with him, when they had a West Coast attack powered by future HoF QB Dan Fouts. Gary in the meantime handled kick return duties and posted sub-400 yard rushing seasons. Gary also caught a lot of passes, earning his only Pro Bowl berth in 1986 as a jack of all trades when he had 80 catches for 871 yards and 8 TDs along with 442 yards rushing, 482 yards kick returning, and 227 yards punt returning. He later posted a career high 1,119 yards on 225 carries in 1988. After an acrimonious holdout that wiped out his 1989 season, Gary was traded to the Tampa Bay Buccaneers. He had a pretty decent 1990 season in which he posted 1110 total yards from scrimmage, and although the rest of his career in the NFL was largely injury riddled, Gary was enshrined into Tecmo Super Bowl lore- as an extremely underrated back. 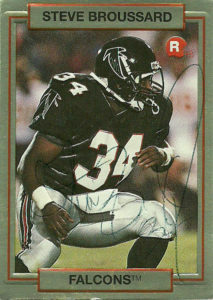 He’d split time with the Bucs and Lions in his final year in the NFL (1993). After a year off Gary returned to football to play for the CFL USA initiative and the Memphis MadDogs in 1995. He’d be released in camp the following year by the Roughriders. In 2006, Gary was inducted into the Arkansas Sports Hall of Fame. Of note, if you calculate all of Gary’s time between the three leagues, he has over 14,500 yards from scrimmage. I had tried to get his autograph a few years ago. He checked many of the odd boxes that I liked: 80s runningback, Action Packed Rookies card, and a player on Tecmo Super Bowl. I missed out on him because in his hometown there is a Court and a Cove that have the same street name but are in totally different places. Thankfully after a second attempt I was able to knock the former elusive back out. This Action Packed card, like many in the set, was quite common, but it is a good action shot and the emboss shows up well on it. The SkyBox 1992 was another one of my favorite sets of that era. With the large name at the top and crystal clear photography, it really set itself apart from the competition.